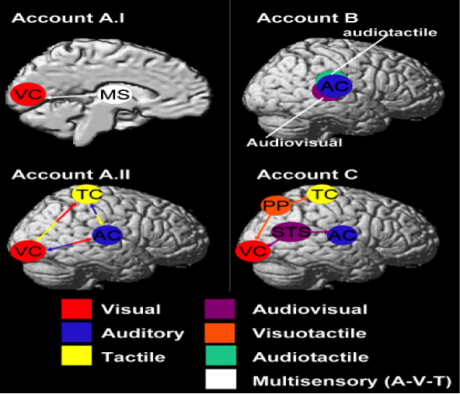 Multisensory learning (MSL) helps an individual learn by using more than one sense. For children with dyslexia, the use of the visual, auditory, kinesthetic, and tactile modalities can be very helpful. 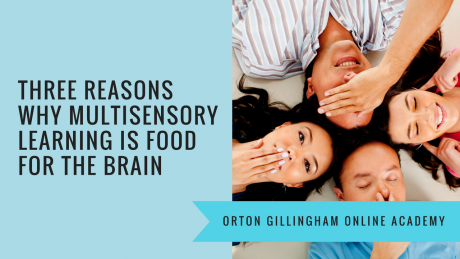 A major component of the Orton Gillingham Approach is that it must be multisensory. This approach aligns perfectly with how our brains learn. When both teacher and student understand how we learn based on neuroscience, it results in a mutual “buy-in.” Let’s look at three reasons why multisensory teaching is so important. Experts believe that students remember what they learn while using multiple senses more effectively than while using one sense. There is scientific evidence that Multisensory Teaching is the perfect brain-food for learning. According to research, neuroimaging studies have shown that there is a greater amount of activity in the brains information processing areas following a multisensory input than there is following a single sense input (Willis, p. 111). In Judy Willis’ book, “Brain Friendly Strategies for the Inclusion Classroom,” a study was conducted on learning how to juggle in order to support the theory of multisensory learning. (Draganski, Gaser, Busch, & Schuierer, 2004). They found that after several weeks of practice, the brain scans of the subjects showed an increased number of synapses and dendrites in the brain regions stimulated during the juggling sessions. The implications of this study are formidable! Willis discovered that if more brain stimulation promotes growth of synapses and dendrites and more areas of the brain are stimulated when information is presented through MSL, then multisensory lessons can stimulate the growth of more brain connections. This leads to better retention and faster recall. We all learn differently and do not process information the same way. Many of us have a specific way of receiving and retaining information that is individually optimal. Some of our students have strong auditory processing skills and can understand something merely by listening, while others may need to draw or need a visual cue explaining a concept. Some students need to touch and learn by doing. Though there are children who respond well to the “watch and listen” approach, they still may not be processing information most effectively. This is evident when we look at neuroimaging. Multisensory learning ensures that all of our students, regardless of their learning preference are provided with multiple ways to learn and understand information. What do we need in order to learn? Attention! Our attention must be activated in order to learn. MSL demands attention and focus in a way that is engaging and enjoyable. It stimulates the RAD system (Reticular Activating System) in our brain. This is the fight or flight part of the brain. We are wired to survive without reading. Therefore, we need to create a teaching/learning climate that is low-stress, fun, and novel. Multisensory learning is a perfect recipe for feeding our RAD system. If a student is engaging in a physical or tactile activity, as well as listening, seeing images, and speaking, there is not much of an opportunity for their attention to wander. 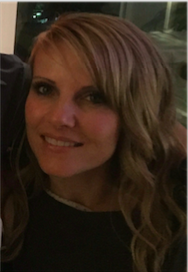 Want a real bang for your “learning buck”? Teach your student by using a multisensory approach and then ask your student to apply the same MSL strategies while teaching you in return. 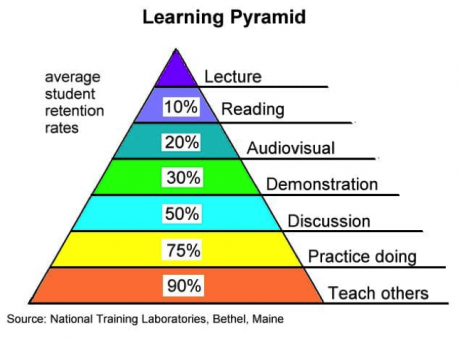 This is a real “bang for your learning buck.” I like to introduce the learning pyramid to my students. I teach a concept and then have my student teach it back to me. My students like to wear the “coach hat” while teaching. They find this quite fun. I also ask them to change their voice while they teach. This adds humor, is novel, and results in increased attention and retention. 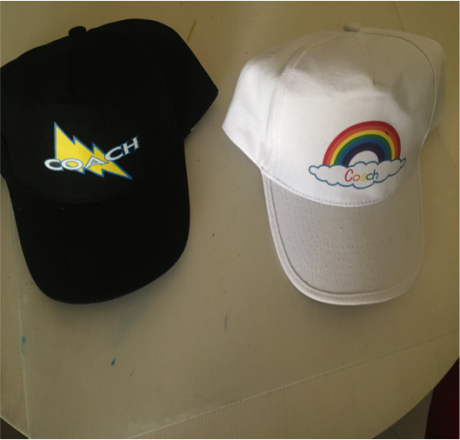 Coach hats designed by one of my students! Willis, J. (2007). Brain-friendly strategies for the inclusion classroom: Insights from a neurologist and classroom teacher.